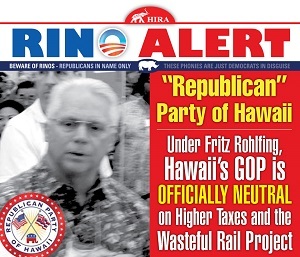 only four short months away , the Honolulu county GOP is also going off the rails . . . probably since they don't make training wheels for political parties . Before we get to the direct assistance to Democrats coming from Republicans, let's look at the deliberate mess that's been made of Oahu's empty shell of a county party organization. 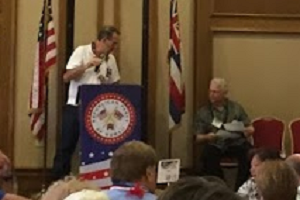 In March 2015, Fritz Rohlfing got elected Honolulu county GOP chair. Then Fritz bailed on the county party to run for state party chair two months later. So, once he became state chair, Fritz replaced himself with con troversial, one-term former state house member Richard Fale who (at last report) was still under criminal investigation by the State Attorney General's office (more info at Fale's website which appears to have been taken down in favor of highlighting his legal problems: http://richardfale.com/ ). This story broke BEFORE Fritz appointed Fale as county chair, so you'd think that was a poorly-vetted political appointment . But, hey, this is the same tone deaf Fritz Rohlfing who enthusiastically backs Democrat convict Rod Tam as a newly-minted Republican candidate in 2016. Still, with political reality hitting home, it's no surprise that Richard Fale ( who only last month assaulted and stalked a GOP state convention delegate whom he suspected of being the whistleblower in the state's case ) merely lasted in the position for a short while and was either fired or quit from the county chair post. 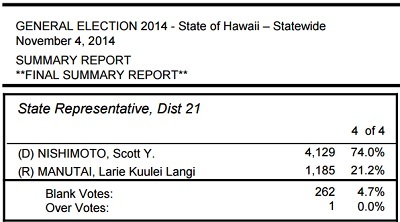 So now, with Fale having been replaced with a brand new face, the entire Republican political strategy for the entire island Oahu is in the hands of a one-time candidate for state house who got totally hammered ; receiving only 21% of the vote in the 2014 General Election . Sorry, make that 21.2% of the vote. [That's six votes more.] Her name? Larie Kuulei Langi Manutai . So who is political novice Larie Kuulei Langi Manutai who is now running a major political party for the entire island of Oahu? Well, she was a ticket seller for seven years at the Polynesian Cultural Center. And then, after losing her 2014 election 74% to 21%, she has held a secretarial position at the office of Rep. Andria Tupola. She also donated $200 to Rep. Feki Pouha's campaign. With this meager political background and loyalty to Fritz Rohlfing, Ms. Manutai has been 'put in charge' of helping Oahu's federal, state and county Republican candidates with the expectation that they will do as well as she did in her election . . . or the point was simply keeping the position from being held by someone with experience and proven competence. Such a complete shame. The Fritz Rohlfing 2016 strategy is to hand Democrats easy victories by keeping county GOP committees in disarray through appointing seat-fillers and fellow church members with little to zero experience at actually winning . The old adage of "it's who you know" is alive and well. Seriously, you want to have faith in the local GOP. But this appointment would be like Trump picking someone from the mailroom at Trump Tower to be his new national campaign manager four months before the election. COUNTY GOP'S MASSIVE PROBLEMS IN 2016 . . .
You read it here FIRST. 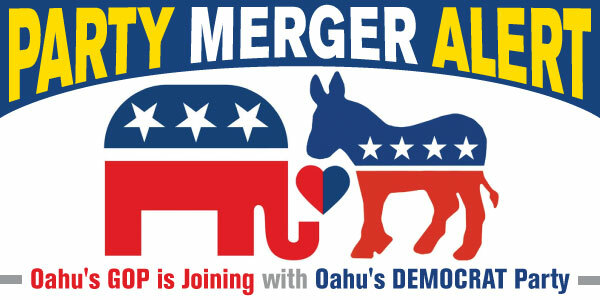 The merger of the Honolulu County GOP and the Honolulu County DEMOCRAT Party is being actively pursued by RINO's and closet Democrats who have infiltrated the local Republican establishment. 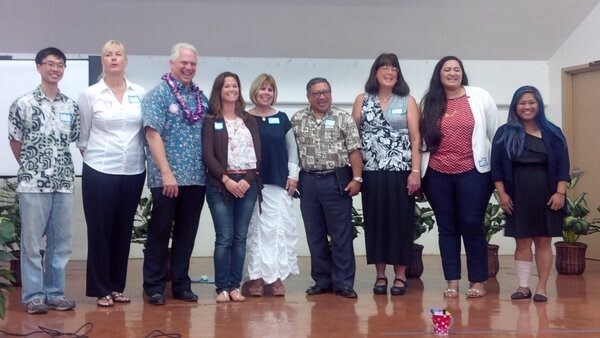 Sorry to say, while leaders of the Hawaii GOP have been abusing their positions to actively prevent the party's state, county, district and precinct organizations from being utilized to advance conservative reforms, policies and principles in order to save Hawaii from failed Democrat governance, party leaders are taking things in another direction: ENDORSING DEMOCRATS. That's right. Endorsing Democrats . With heavy-handed manipulation by state party leaders, the Honolulu GOP county committee is currently lining up votes of county and district party leaders to endorse a Republican-turned-Democrat party-switcher on the 2016 ballot , in addition to the endorsement of a high-taxing, big-spending politician who might not even be a Republican anymore . . . plus a possible endorsement of the Trump-hating guy who actually wrote and promoted the legislation which created the overspending HART agency, supported Transit Oriented Development, and wrote the bill changing the City Charter to require "steel wheels on steel rail" along with other pro-rail measures. This is ALL happening at the urging of the same guy who tried unsuccessfully to cancel next year's GOP state convention in order to keep failed party chair Fritz Rohlfing and his minions in office through the 2018 elections . 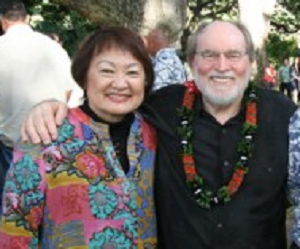 Rohlfing's lackey and possible Democrat infiltrator Andrew Walden is pushing the GOP to endorse proud Democrat Ann Kobayashi for re-election to the Honolulu City Council. Yes, the leadership of the County GOP has nothing better to do than help Democrats get elected. Never mind the actual job of the county GOP: Voter registration? Nope. Canvassing? Nope. Voter ID? Nope. Fundraising? Nope. Coalition building? Nope. Membership drive? Nope. And w ith ZERO progress to report on the committee's actual job description, Rohlfing and Walden want to use the Republican Party to help more Democrats get into office and more Democrat policies get enacted. Those with long memories remember 1988 like it was yesterday. 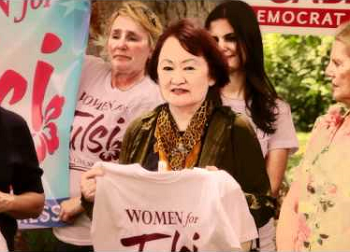 That's the year when three Republican elected officials -- Ann Kobayashi, Donna Ikeda, and Virginia Isbell -- told the Hawaii GOP they were jumping ship to the Democrat Party because they couldn't stand the conservative values of the Republican Party . . . They were feeling just like Beth Fukumoto, whom Bob McDermott warns might wait until AFTER this year's election to make her jump to the Democrats. 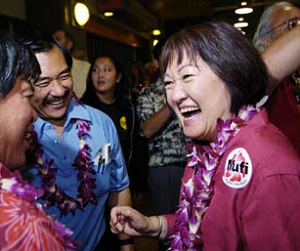 As these pictures show, Democrat Ann Kobayashi has gone out of her way to ingratiate herself with her new party during the past nearly 30 years. Aren't Hawaii voters confused enough?? For our extremely weak Hawaii GOP to endorse one or more candidates from the opposing party seems bound to be as counterproductive as embracing Rod Tam. 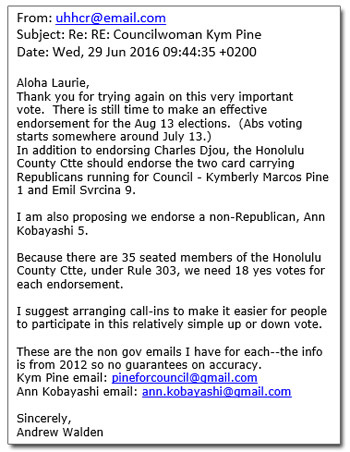 Yes, endorsing Democrat Ann Kobayashi -- who is endorsed by the usual assortment of Democrat unions , like the HGEA, UPW, Teamsters, ILWU, SHOPO, IBEW, HFA -- is the top priority of the Honolulu County GOP in 2016. County Chair Manutai is calling a special meeting THIS WEEKEND to help Rohlfing and Walden to secure the party's support for Kobayashi. 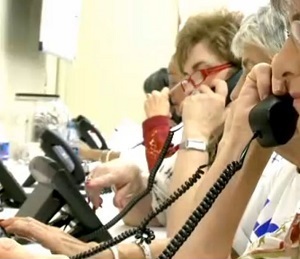 Walden is urging the overwhelmed county chair to "make it easier for people to participate in this relatively simple up or down vote" by arranging call-ins. You see, time won't be 'misspent' by the county committee doing any work which actually helps Republicans to get elected or Republican policies to get promoted -- WHICH IS THE ACTUAL JOB OF THE COUNTY COMMITTEE . Their letterhead is merely being exploited for a press release from the county committee that RINO's want to circulate. As Walden's e-mail further reveals, he is even pushing to endorse former Republican Kym Pine-Ryglowski for re-election to the City Council; even though she is no longer even listed on our party's website among the tiny and still shrinking list of all elected GOP officials in Hawaii . 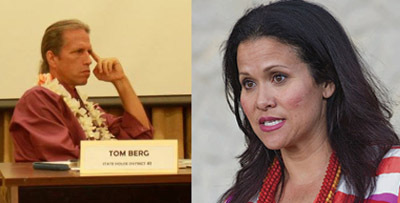 . . to say nothing of Pine-Ryglowski's steady support for higher taxes, wasteful spending, giveaways to government employees, the runaway rail project, and the misguided creation of Hawaii's super-expensive (and now defunct) Obamacare Connector Exchange. Last weekend, in a moment of rage reminiscent of Tom Berg's drunken confrontation with the Secret Service, Andrew Walden stormed out of the last county GOP meeting (the first meeting held in ages) and slammed the door behind him when he was unsuccessful in convincing the Honolulu GOP county committee to do his bidding. To make Walden and Rohlfing happy, another county meeting had to be immediately scheduled for this coming weekend so they could to try to muscle county committee members into giving his favorite candidates their seal of approval for useless PR purposes. 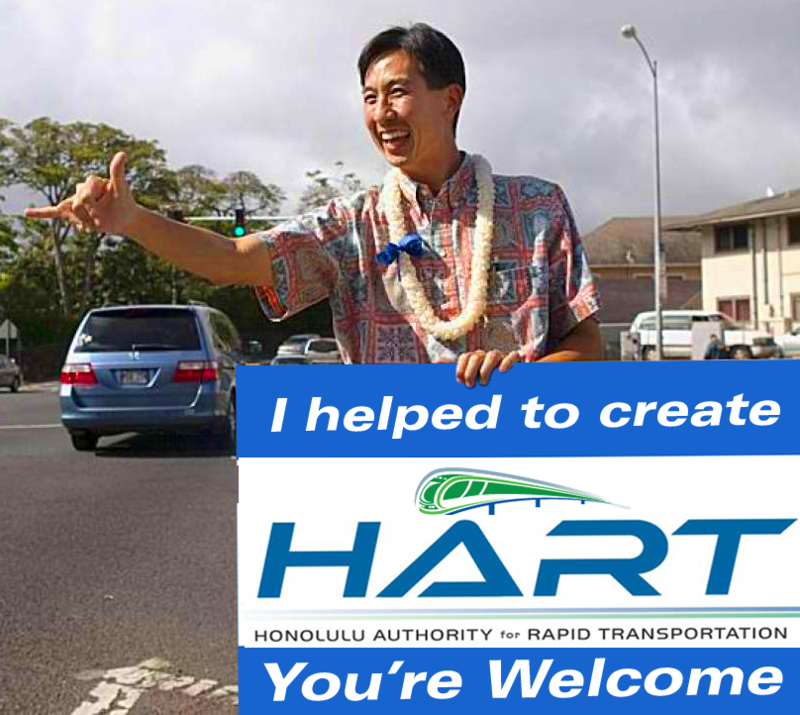 The crown jewel Walden seeks is the County GOP's endorsement of perennial candidate Charles Djou -- the candidate who literally wrote the City laws creating HART , requiring a steel wheel rail system, establishing anti-automobile Transit Oriented Development policies, and wasting hundreds of millions of dollars by moving the rail from Salt Lake to the more expensive airport route. The endorsement sought by self-revered 'kingmaker' Walden will probably look as useless as this: "Attention all Oahu voters: The Honolulu County GOP has endorsed the following Democrats and RINO's. Please vote accordingly." That really doesn't seem to be worth all this effort and heartache. It will probably go down in flames like one of Rohlfing's legal strategies for the GOP, such as suing to get Cynthia Thielen's daughter kicked off the ballot. That dog did not hunt as the bogus lawsuit and desperate attempt for publicity got tossed. As a RINO party leader, Walden has been working on this pseudo-strategy for six weeks or more. 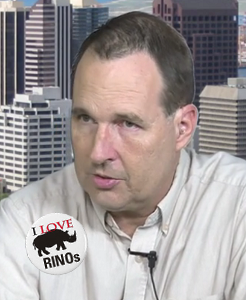 Ever since he published his mysterious screed on his humorous blog, entitled " Hawaii Republicans-Political Kingmakers? ", Walden tries to confusingly explain how he believes that the voters in the March 8th Hawaii presidential caucus (mostly conservative supporters of Trump and Cruz) can hardly wait to vote for a RINO or a Democrat in a county election . . . especially now that Walden has his hands on the party's entire e-mail list . Sorry, but wishful thinking doesn't beat Democrats. THIS Saturday, we'll see if Walden, Fritz Rohlfing, Boyd Ready and the rest of the "Rod Tam" RINO's have worked the phones and bent the rules in order to secure the votes to officially endorse Democrats and RINO's in 2016. In the meantime, while the Hawaii GOP refuses to bother mounting a 'ground game' using phones and door-knocking or even an 'air game' by running any political advertising in an election year ( choosing instead to invest most of its meager income acquiring overpriced real estate for a luxury suite of offices in upscale Kakaako ), it's clear that the priorities of the RINO's are to embrace their inner liberals and shamelessly unite with the Democrat Party before this year's General Election. Just remember, HIRA warned you first. That's why new and improved party leadership is needed in 2017 in order to salvage the time left between now and the 2018 elections. Yes, things are that bad. Through the looking glass, now that Hawaii has become Wonderland, you can see the topsy-turvy world of crazy occurrences like Republicans helping Democrats -- or perhaps a press release containing endorsements from an inactive county party being published on a solitary blog and changing the outcomes of elections. But with sober 20/20 vision, you can actually see how nothing replaces a solid political strategy, powerful themes, irrefutable statistics, strong marketing, persuasive PR, and a 24-month ground game which never sleeps. Sadly, until things change, a team of rank amateurs, RINO's, closet Democrats, and a Hellreich-allied blogger will continue driving the Hawaii GOP into the deepest pit of despair imaginable. Please know that it's okay to lose all hope in these people and wait until the Hawaii GOP is "under new management". 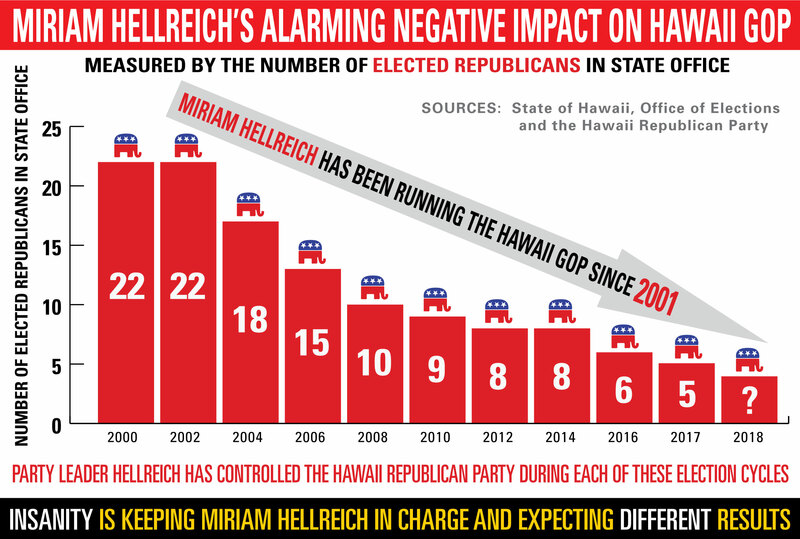 Please donate to HIRA Action, the official SuperPAC for the Hawaii Republican Assembly, to support HIRA's work to educate voters about failed Democrat policies and about conservative Republican solutions for Hawaii..